Vintage Jazz Mart is the world's oldest magazine for collectors of Vintage Jazz and Blues 78 & LP Records, and has been essential reading for collectors worldwide for 65 years. It was founded in 1953 by Jazz record collector and former Battle of Britain pilot Trevor Benwell, who remained as Editor until 1990. Since then it has been published and edited by writer and record dealer Mark Berresford, ably assisted by Russ Shor, who, as well as contributing insightful reviews, handles the USA side of VJM's subscriptions. 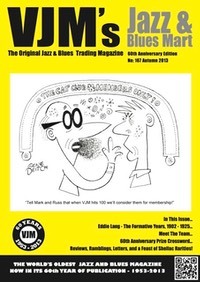 Our distinguished team of expert writers and reviewers, including Max Easterman, Ate van Delden, Nick Dellow, Henry Thomas, Howard Rye and Björn Englund, and regular specialist guest reviewers, ensure that each issue of Vintage Jazz Mart is a great read as well as the best resource for finding rare Jazz and Blues 78s. Meet the regular team here. Each issue is packed with articles, discographical research, our justly-celebrated review section, and thousands of records for auction or sale, offered by the leading collectors and dealers in the jazz and blues world. There’s a lot more content, both articles and records auctions, in the ‘hard copy’ and in the online edition - this is merely a taster of what you can expect from subscribing - Click Here to Subscribe or Click Here to buy a single Online issue - back issues from issue 181 are also available online free of charge! VJM caters for collectors of all styles and speeds - 78s, LPs, EPs, CDs - even cylinders! So whether your taste runs to Bix or Bowlly, Bunk or Monk, Jelly, Coltrane, MJQ, NORK, ODJB, Robert Johnson, Charlie Patton, Muddy Waters or Ethel Waters - Red Hot Jazz, Country Blues, Big Band Swing, Eurojazz, or Hot Dance Bands, VJM's Jazz and Blues Mart is the choice of the discerning collector. VJM also operates a highly effective consignment service for collectors and estates wishing to dispose of quality Classic Jazz and Blues collections without the hassle of typing lists, grading, running auctions and packing parcels. For details go to our Contact Page. A unique feature of Vintage Jazz Mart is the Free Wants section. Magazine Subscribers can advertise for their wants at NO CHARGE for at least 3 consecutive issues. The results have to be tried to be believed! Mark Berresford Rare Rcords Ltd.